At the risk of sounding like a broken record, let me tell you a true story. 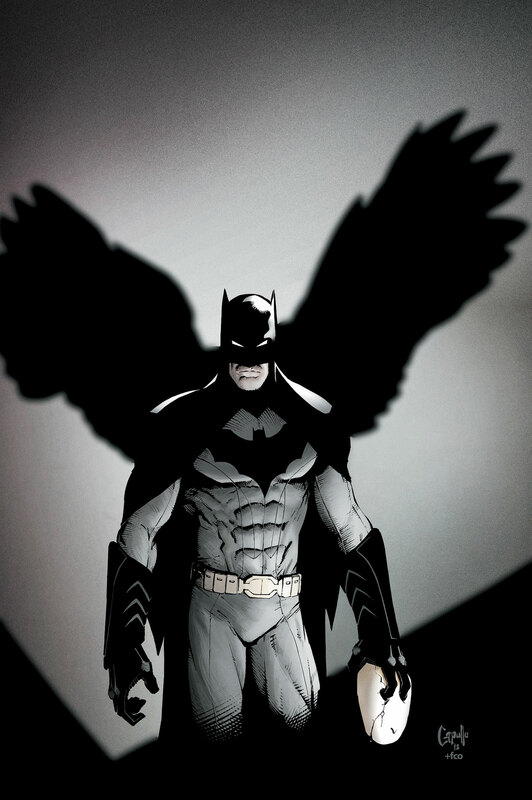 It’s slightly earlier today and comic book news Web Sites are beginning to post articles suggesting something big happens in Batman #10 – the latest chapter of Scott Snyder’s Night of the Owls crossover. Seeing as how I haven’t taken my lunch break yet and that we live in an amazing era of technologically, I decide that I might as well just download and read the comic before some idiot online spoils in a headline whatever it is that happens in this issue that I’m sure will change Batman forever or at least until Tony Daniel gets the opportunity to taint it. I’m sorry. That was off topic, unnecessary and just mean. 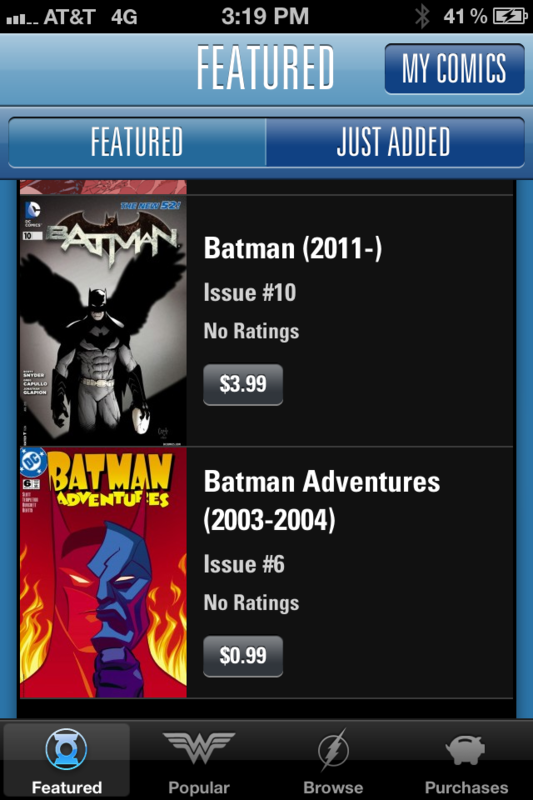 As I was saying, I decide to download Batman #10, so I open the DC app on my phone and find the issue in question. A very simple and quick task because the app is pretty well put together. But there it is: that giant, ugly price – $3.99. Almost $4 to read a copy of a comic I won’t even own and that will disappear from my device the next time DC or Comixology decides to update their app. Almost $4 for something that will disappear forever should Comixology go bust. I know I’m not saying anything new here, but we’re talking almost $4 for a comic that, while I’m sure is going to be entertaining, I KNOW will not be $3 better than the old Batman Adventures comic listed directly below it. 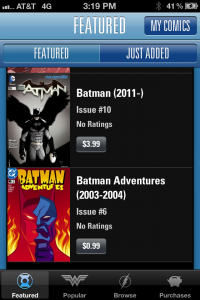 You can’t tell me it costs DC significantly more money to host the Batman comic than the Batman Adventures book. I get that Batman is a new item that they need to exploit for as much money as possible, but come on. It’s too much DC (and Marvel). You know it. I know it. The Direct Market retailers you’re trying desperately to protect know it. For $4 I need to be downloading something that’s mine to exploit basically as I want. If you’re worried about piracy, lower your prices so people feel like your product is worth buying. We’ve reached a point where technology can allow digital comics to be amazing and reach a far larger audience than the direct market reaches today. What are you so afraid of? Why just continue to milk the same small herd of cows? There ARE more cows out there, just look at the way the Walking Dead sells in book stores. The fact is comic shops have obsessive collectors and tons of other often expensive merchandise like statues and t-shirts to fall back on that set them completely apart from what Comixology can offer. The Direct Market is actually better positioned than record stores ever were to survive a digital revolution. They had no plan B. Anyway, long story-short: I just could not bring myself to pay $4 for the honor of reading a comic book that I wouldn’t own. I might even have money in my iTunes account from a gift card. I didn’t bother to check because I still didn’t think it was worth it. So instead of reading Batman during my lunch I’ve written this nonsense. Fix this pricing scheme DC. Make digital comics awesome. 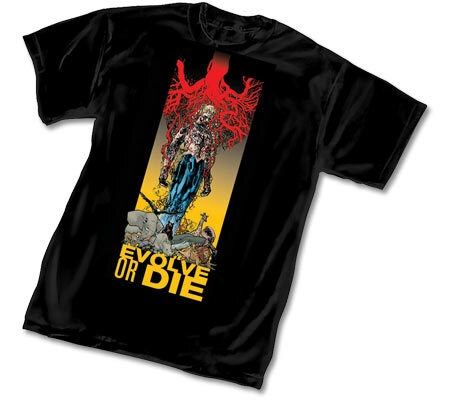 To steal a phrase from one of your expensive t-shirts which I gladly paid for: Evolve or Die. In contrast to all of that, I definitely have no regrets about the $1 I paid for the digital-only (or at least digital-first) Batman: Legends of the Dark Knight #1 by Damon Lindelof and Jeff Lemire – even if I still own nothing. That “book” featured roughly 20 pages of story formatted specifically for digital presentation, which means it’s definitely less content than 20 typical comic book pages – but it’s still a well told, complete story. If you can’t make digital versions of your regular comics available at a price that makes sense, at least keep pumping out quality content like this. As for Batman #10, when I finally got a copy and read it, I thought the twist was garbage. I was worried that Snyder’s epic was headed towards a horrific car wreck ending of Loeb-ian proportions until I read that the character in question was actually very old. Now I’m not sure how I feel. The confrontation with the Court of Owls is definitely anticlimactic. On the positive side, the big shocking twist does justify some elements to the art in issue 1 that people had criticized. I’m hoping there’s at least one swerve left, because I definitely don’t love this concept… yet. Note: I’m sure some people would have similar complaints about paying $4 for the physical books, but at least with a real comic you get an actual book in your hand that you will be able to some day use as kindling for a campfire or something. Mmmmmm. S’mores. Did you know there was an apostrophe in S’more? I didn’t. I just learned that. The real comic costed $7.99.